Everybody likes saving money, and nobody likes being cold. Wouldn’t it be great if you could somehow combine those two things into a weekend project? Well, the good news is that you can! If you’re looking for ways to warm your home, keep your family more comfortable, and lower your energy costs, then you’re in the right spot. As promised, here are four ways that you can turn up the heat this winter without actually turning up the heat. Did you know that the average cost of a furnace repair is about $300, while the average cost of annual maintenance is only around $100? This comparison matters because many major furnace breakdowns can be prevented with regular maintenance and annual inspections, meaning you can avoid costly repairs just by having your heating system checked once a year. Not only that, but a maintained furnace is an efficient furnace, and that translates to a warmer house and a lower heating bill. Humidifiers are a great way to add more moisture to the air in winter, and this can reduce dry skin, prevent chapped lips, and make your house feel warmer. 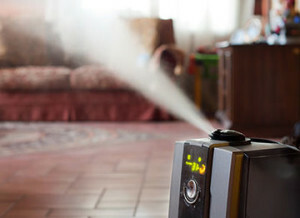 Yes, that’s right—a humidifier can make your house warmer. Moist air retains heat better than dry air, so running a humidifier will keep you cozy and let you turn down the thermostat. 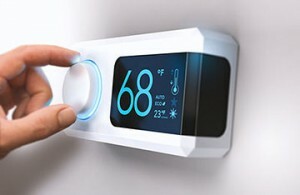 I magine you had a thermostat that you could program so that it would increase the temperature of the house before you woke up in the morning and before you got home from work in the evening. And then imagine that the same thermostat could be programmed to lower the temperature when everybody was sleeping, out for the day, or away on vacation. Sound too good to be true? Well it’s not, and a modern programmable thermostat can do all these things, and save you money on heating bills at the same time. These simple steps are things you can do on your own around the house in a short amount of time, and the money you’ll spend executing the tasks will be recouped quickly thanks to what you’ll save on your heating bills. Moreover, the money and headaches you’ll save on furnace repairs and breakdowns by having your heating unit maintained properly are priceless.